I’ve talked about how to use social media to find and connect with influencers. Today, I’m going to talk about how to BECOME an influencer. Pick a platform: Blog, podcast, any place you can share your expertise. Think about what medium you enjoy working in. For some it is writing, for others it is speaking, and for some it is a visual medium with video or photography. 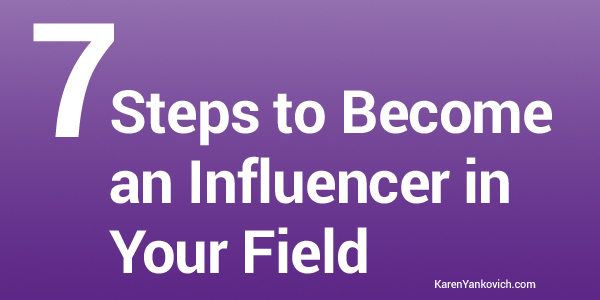 Because the steps to becoming an influencer will take time and consistency it’s important to really nail down your favorite method of connecting and of doing the work. Because I won’t lie, it will take work to make yourself an influencer, but work that is well worth the effort. It will take work to make yourself an influencer, but work that is well worth the effort. Once you have picked your platform it’s time to get busy! First: Share your best stuff. This idea is nothing new, but still needs to be said. Sharing valuable information that actually improves the lives of your tribe will be where you spend the most time, and get the most return. Followers will notice that you offer a great value to them without expecting anything in return. Be consistent and post often. Sharing knowledge with no expectation is paramount to becoming the influencer you wish to be. Second: Specialize more if you can. Try to niche down into an even smaller division of your market. The reason this has a lot of power is with a very specific and specialized niche you stand a better chance of becoming The Go-To person in that field. And that is a win toward becoming influential! It’s time to really get comfortable being out and in the wide “open” internet. Becoming influential means you will have a lot more eyes on you, and that’s a good thing, but I know it can be scary. Work on really staying true to your business Why. Start to shape the conversation around your business niche, and your influence will truly come. Fourth: Partner with other influencers. Remember those blog posts I wrote about building relationships online and how to start that before you need them? (Check them out here and here) (link) Well here is a great example. Now you have things to say and your favorite platform to say them on. It’s time to partner with another influencer to help get the word out: write a guest post, get an interview, offer to interview them, write an article for their publication, contribute to their comments, offer to talk at seminars and conferences they attend, the list goes on. When you get on their radar you get on their people’s radar and that helps rocket you to the influencing top much faster. Yes I know it sounds awfully daunting, but that’s what ghost writers are for! Writing a book is still a huge mark of credibility, even in this day of online everything. People see a book as evidence that you know what you are talking about. You also have the potential of reaching a whole new section of fans and followers. Sixth: No hiding, get your contact information out there and make it easy to find. Respond back to fan emails, invite and encourage people to call or write, show a willingness to connect in person or on the phone. Quite simply, be available. This can generate a lot of discussion among your fans and the end result is often, loyalty. Which means they will talk about your stuff over and over again. And there is no better influence than that lovely piece of the market called: social proof. Lucky number seven bonus step: Track what works. What is one action you can take today? Check out the top 10-20 influencers in your niche and see what they are doing. What content are they sharing? What will it take to be there? Then come on over and join my LinkedIn group where we can talk influencer strategy all day long! Can’t wait to see you there and at the top of your game. Hi Karen. I’m definitely going to do some work on your bonus tip this weekend. Your tip on writing a book is a definite must if one wants to be perceived as an authority or influencer. I noticed after publishing my first Kindle book and including the fact on my profile, that the quality and types of professionals who started to reach out to me were those with whom I could do business in the long run. Thank you for sharing your tips with your audience. good tips! thanks for sharing!! Awesome advice Karen, thanks. I need to take some actions quickly! Enjoyed the post Katen. I agree there are many ways to become an influencer and I’m currently working on a book and all the advice is that I should create an author platform, which I’m in the process of doing.